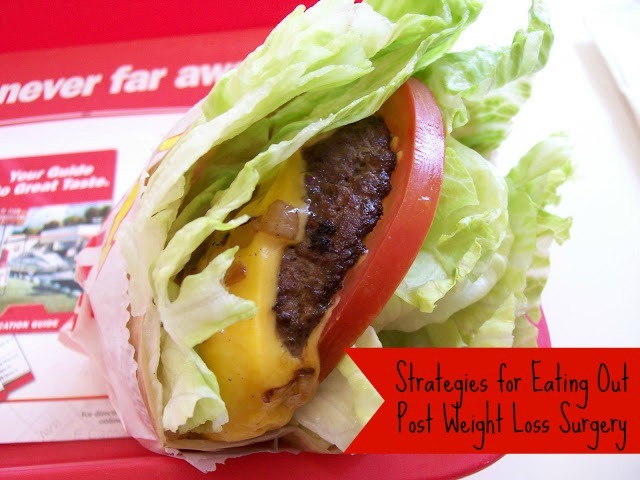 By request from blog reader Mary I'm sharing some strategies I employ when eating out after having weight loss surgery. The first section is about my choices at sit down casual restaurants and the last section is about my healthiest options at fast food, quickie joints. Plan Ahead: If possible get a copy of the menu and plan what you are going to have in advance. That will save you from making poor choices on the spur of the moment. Most restaurants and fast food joints have a web presence, Google their website and read the menu in advance. 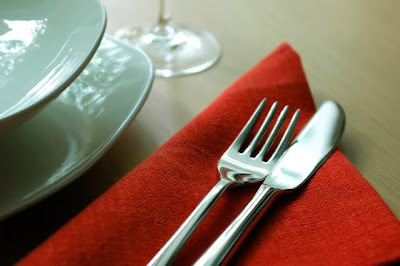 Here's another great resource for menus. Make substitutions: You can still order your favorite chicken fajitas, but instead of the Mexican rice and refried beans, do double beans or ask for a salad on the side. Ask for double veggies instead of the starch. At breakfast get sliced tomatoes or fruit instead of hash browns. You get the idea — this stuff will take a little extra thought at first, but in no time it will become second nature. If it's somewhere else on the menu you can probably get it as a substitution. Portion it: Ask the server to box half up right away. I just say, "I really want dish xyz but that looks like a lot can you box half up for me" Then get yourself one of these groovy gadgets that heat leftovers up without drying them out. We are no longer members of the clean your plate club. Facts are facts. We will sadly waste food or learn to walk out with boxes. Hopefully you can split meals with the person you are with but that isn't always possible. I hate to waste water so when they ask for drinks (I don't drink with my meals post weight loss surgery) I say something like, "Nothing to drink for me, just had a huge coffee" and that stops them from asking over and over again. Leftover Steak becomes Tortilla Pizza or this awesome Brunch Casserole. I love crab legs when I'm with a group. They take forever to eat, great protein, looks like I've ordered a lot so no one feels self conscious about my tiny portion, and leftovers are great the next day. Enjoy! Enjoy spending time with the other people in your group and make the food secondary to the social event. In & Out Burger: "Protein-style" Single Cheeseburger with grilled onions (Protein style = wrapped in lettuce instead of a bun.) Most burger places will do variations of this. Five Guys: Ask for no bun, they put it in a plate on top of lettuce, you can add grilled onions, cheese or some bacon. Taco Bell, Del Taco: Order of Pintos & Cheese/refried beans with a scoop of meat or chicken added. El Pollo Loco: Grilled Chicken Breast (single piece - they are huge) or $1 side salad minus tortilla strips & the $1 Chicken Taco El Carbon. I discard the tortilla and dump the chicken on the salad. Great meal for $2. McDonald's: Premium Caesar Salad with Grilled Chicken, no dressing (ask for salsa packets), they will sell you a grilled chicken breast patty only or a burger patty only too. Sbarro: Side of Meatballs or Sausage with Sauce. Wendy's: Chili with cheese. Burger patty. Subway, Submarina, Firehouse: They will turn any of the subs into salads. Watch the dressings, ax the croutons/breadsticks/flat breads. Starbucks: Sous Vide Egg Bites, Egg White Whole Wheat Feta Wrap (I ask for double cooked makes it crunchy), Oatmeal (in a pitch when traveling I will do oatmeal, complex carbs, add cinnamon from the coffee bar), Protein Plate give away the bread, Soy Lattes. Here's my Starbuck's Post WLS Guide. KFC: Single piece of Kentucky Grilled Chicken, Green Beans side. Rubio's: You can have grilled fish on any of their salads. Ask for dressing on the side or better yet use salsa. My favorite is the Balsamic & Roasted Veggie Salad and I add Grilled Tilapia. Diners, IHOP, Denny's: Scrambled Eggs with cheese and avocado is my standard. If they have turkey sausage even better. That's about all I can think of right now. I'll add others if they come to mind. Feel free to post your orders or restaurant adaptations in the comment section. These are just things as a post-op I personally have eaten. When in doubt, ask your dietitian/bariatric surgeon's office. Hey and don't feel guilty if you make a poor choice. Life happens. You can't rewind time, so you might as well get over it. Start planning your next healthy meal. Great guide, Shelly!! Thank you! I often look online at a restaurant's menu before going out so I know what my options are. I also will order a kid's meal instead of a regular meal. Some restaurants, like Cracker Barrel, have better choices, like shrimp, on their kids' menu. Awesome post! With traveling and not being a very good cook I sometimes eat out more than maybe others do. Bahama Breeze - Jamaican Grilled Chicken Breasts (grilled chicken breasts, green beans, and mashed sweet potato) Available in regular size with 2 breasts or lighter portion with 1 breast. I order the regular size and have enough food for 3-4 days! Another favorite is BBQ chicken. If there is skin I peel it off and most places don't add alot of sauce so it's just enough to keep it moist. I also love Cracker Barrel too because they have low carb options. That salad from Chick fil a is the freakin heat!!! I make sure I look over the appetizers on a menu. I like to order shrimp cocktail or crab cakes and ask that they are brought out with everyone else's dinner. l - I drive by Wendy's and never even think about the chili YUM! Almost any breakfast place will do a side of cottage cheese, also. At Red Robin, they have a plate...chipotle char grilled chicken...I split that with my hubby and it's very filling. Their chili is fab, too. Most steak places (or heck, even Denny's) will also let you add a grilled shrimp skewer for $1.99 or something like that. That's an easy add on for us. Michelle, Chick-Fil-A's Chargrilled Salads are sooo good! We have a routine. My daughters get their stuff, I get my salad (we ditch the "extras" they give you to put on top and I use half a packet of FF Italian dressing) and I eat as much of the salad as I can (usually all the meat, half the veggies) and the girls finish it up with their sandwiches. Also Denny's has wonderful Egg Beaters and Egg whites omelettes. I order from the senior menu to get a smaller one and then eat half of that with some turkey sausage or, on occasion, bacon. This is an awesome post - so many of the options on your list are things I wouldn't have thought of on my own! Thank you thank you, this is fabulous! Oh I love, love, love Wendy's chili! Once I could first eat solids, I became a chili connosouire (sp?). Wendy's was (and is) my fav. Chicken and I don't get along so well post-op, so I usually go for the seafood or steak type options (or ground meat). Love your ideas too! Thanks again! El Pollo Loco now has a skinless breast meal, served with pinto beans and steamed veggies. It's enough to feed me for 2-3 meals, and it's only about $5. Red Robin - protein style burger with a salad on the side. I steal 2 steak fries from my honey. Their website has a cool interactive customizer so you can play and plan your food before you get there. I went to Fresh Choice last night for my first dinner out (I am 4 weeks out). I thought evne tho I am not suppose to have soup - I was sure they would have a nice soup. Well, almost all were broths and noodles - so I was kinda sad. I then spotted the chili - with some cheese on top it was YUMMY! I did get a weird look when I order 2 drinks for the Hubs and daughter and then nothing for myself . . . Thanks for this great post, and all of your recipes. I just had rny on Monday, but I have been reading your blog for a couple months. I'm looking forward to being able to eat food again and being able to choose the best thing on the menu for me to have. I'm glad to know In-n-Out is still an option, in a few months anyway. Great ideas to think about. I am still on full liquids and actually the week that I will be able to have "real" food I am off to Orlando for a conference and will be with the family. Talk about a real test!! These are things to think about tho. I have some idea where I will be eating in the evenings so I will be checking them out online first. Qdoba is my new favorite place for fast Mexican. I order the "Craft Two" with the tortilla soup with chicken and a dollop of sour cream and then with the naked taco salad topped with chicken, pico de gallo, and a sprinkle of cheese. Qdoba's set up is similar to Chipotle but they have more menu items. The "Craft Two" is small portions. The tortilla soup there is to die for...and the tortilla strips are optional. You can find the nutrition info for their food on their website. We have Outbacks in our area. An Outback Special 6 oz steak (I take home half), a chopped blue cheese salad, and sauteed mushrooms is the best $10 meal on the planet! I want to ask you about olive garden what is the best soup and food..
Omg..just heard about ur site from a friend..soooo glad I have u now..lol :) great ideas and recipes!! Ideas I wld hve never thought of on my own!!! Wow, i love your blog. Im 1 month post op! And u inspire me! Shelly, I am 5 weeks post op and we talked about your blog the other night in support group. I'm so happy to find you! It's great to see long-term success! Also wanted to add, my favorite thing at Jack In The Box is their Grilled Chicken Strips! I found I can eat 1 or 2 strips, take the rest home, and re-heat them in my favorite yellow curry sauce for a great lunch the next day. Some of the places like Chili's and Applebee's have so many healthier choice's and smaller portion's on their menu's there isn't even much you have to change on a lot of their dishes. Logan's Roadhouse - lunch portion of salmon (available on 2 for 14.99 menu) with sweet potato and side salad without croutons. I'm not sure if they still do, but they used to have a fat-free caesar vinaigrette. I don't know because now I just order the house-made ranch now because I eat low carb. This is a ton of food, and you can also snack on peanuts while you are waiting for your food! Thanks I just had bypass surgery in June and it's hard to order out on Fridays with three men in the house who like to eat I usually just make a salad with a protein. And alot of things still don't agree with. Did not know alot of the things you posted about some of these restaurants, it helps to know. Thank you. Right now Red Robin is doing Wedge Burgers- Where they wrap their burger in lettuce. We're going later for Date Night, soo excited! 6 months till my surgery, but starting this now to get it ingrained that this will be my life now. Oooh I haven't been to RR in years I might have to try that! TY for the heads up. Im 1 week and 1 day Post Op and I feel over whelmed. I'm getting in my protein with Premier Protein Shakes from SAMS. Sugar Free Popcicles are my go to in between meals. Mash potatoes, and soups are my meals for now. I purified some chicken and egg with light mayo for a chicken salad once. Also purified some beans and salsa and it was really good. Glad I found this blog, it has helped a lot. I love Bahama breeze but was wondering what I could eat from there. Thanks for sharing!